Welches Science-Projekt soll bei @onespark in Berlin dabei sein? Sag Juror @kasi Deine Crowd-Meinung! Das OneSpark-Festival findet am 12. und 13. 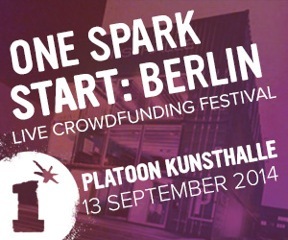 September 2014 statt – ein riesiges Crowdfunding-Festival in Berlin. Ich bin in der Jury für den Bereich Science und darf dort die Projekte aussuchen, die sich auf dem Festival zeigen dürfen. Wollt ihr mir helfen? Schaut mal hier rein: http://www.beonespark.com/berlin/discover/creator_projects?category=science – welche Projekte findet ihr spannend? Ich freue mich über Eure Kommentare bis morgen um 12 Uhr! Die Ecotoilette als Kampfansage an die Blickverschandler Dixi und ToiToi! Ich finde Aescuvest spannend und N#mmer. This is a very cool project – I am really interested in this concept of overcoming the inner critic and how it can help creatives and anyone really overcome crippling fear that is stopping them from reaching their full potential. Such a positive approach to a negative subject. I really like the Inner Critic Doll. As a writer, i’m always battling my Inner Critic. This zip mouth doll which seems to offer a physical manifestation of the InnerCritic is SUCH a great idea!! I’d definitely pick this project. Ich finde das „Inner Critic Doll“ sehr interessant.